The Hoboken Democratic Party meeting last week is echoing with shudders among the Old Guard's pantheon of concerned backers and Hoboken's November ward elections off in the distance. Add the newest casualty to the lengthening list of bad publicity the meeting generated for all the OG concerned; Third Ward Councilman Michael Russo who is expected to launch another run for re-election this November will resign his elevation to Vice Chair of the Hoboken Dems. When the issue was first raised at the meeting, it was another party bylaw brushed off stating a man and woman must hold the top two party position. That response claimed the bylaw was "amended" but behind the scenes after some consideration, the problem was determined as requiring addressing. Russo who was reported initially backing Councilwoman Beth Mason in her desperate quest to be handed Hoboken Democratic Chair later flipped his support leading to Freeholder Anthony "Stick" Romano as the stand-in compromise replacement. In place of Russo, a well placed source said a woman will be elevated into the position of Vice Chair. The woman slated to be handed the title is long time Beth Mason supporter Ines Garcia Keim. Garcia Keim triumphed with her second electoral victory where she's faced no opposition in two Democratic committee elections. 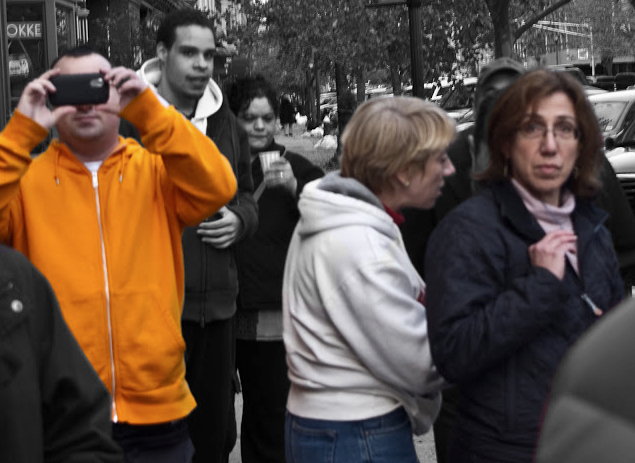 Beth Mason attempts to cower behind Ines Garcia Keim (r ) as James "FinBoy" Barracato returned to the scene of a repeated assault against MSV in broad daylight on Washington and 12th St. outside the Mason Civic Association. The Mason declared "business partner" returned to the street from the the Mason "charity" office which fronted as the HQ of the controversial 2012 Move Forward Nazi Truck BoE campaign. Much of the Democratic Committee scuttlebutt has been described as "meaningless" but the blow back since last week's meeting - with actual video evidence - has Hoboken buzzing. The same source noted Carmelo Garcia's unfortunate actions in the meeting saying, "Carmelo's another ego that is out of control," before admitting there had been no vote for honorary chair - not for Garcia nor for Beth Mason. Last weekend, the HR political column stated they are both honorary co-chairs although no committee member present recalls any such vote taking place. Some consider all this further evidence of how the spinning by the Old Guard to media has spun completely out of control leading to what another source removed from the proceedings described as their "implosion." Last week, Carmelo Garcia trumpeted the meeting on his Facebook page, seeing it not as problematic but "democracy" in action saying when "exercised, there is power and progress." 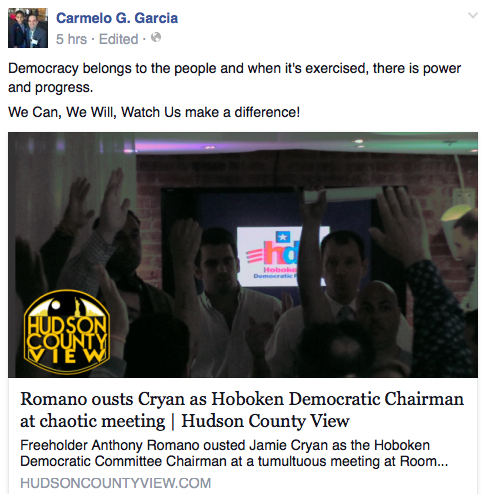 Carmelo Garcia put up the Hudson County View video of the Hoboken Democratic Committee meeting trumpeting it as "power and progress" which "belongs to the people." For those interested in viewing Carmelo Garcia's triumph, here again is the actual video. He can be seen clearly hijacking the meeting from then Chairman Jamie Cryan who he ignores and talks over throughout. If you close your eyes, you might think you were back at a Hoboken Housing Authority meeting. Grist for the Mill is MSV's rumor column. MSV is confident to stand its rumor column against those publishing contrary "facts." Got a juicy carrot for Da Horsey? Email it to smartyjones@me.com.